A C S Rodgers Royal Air Force. 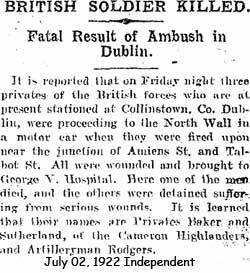 Private Rogers, aged 21 from Collinstown, was mortally wounded in Talbot Street Dublin. He died on Friday the 30th of June 1922 in the King George V Hospital. Private Rogers was travelling in the back of a truck under the command of Second-Lieutenant Beckman when they were fired on from both sides of the street, Private Rogers was hit in the back.